The price of a gallon of gas returned to the $3.70 level during the past week, pushed in part by the increased demand brought on by summer driving, but more so by the radical instability that continues to shake Iraq. The national average and regional figures are reported in the weekly survey published by the U.S. Energy Information Administration. The $3.70 threshold represents the first time since the end of April that the national cost of fuel has been so high. Prices had been declining during May, albeit very slowly, primarily on lower demand in states like Florida and remarkable volatility in the Midwest, notably Ohio and Illinois. Those declines had been held in check by a dwindling supply of crude oil Cushing, Oklahoma, a major supplier of crude to refineries across the nation. However, the military strife that has literally ripped Iraq to shreds in recent weeks has pushed the price of West Texas Intermediate to levels not seen since 2011. Trading started over $107 per barrel Monday, before settling at $106.17 by day’s end. Crude prices were retreating sharply in after-hours trading late Monday night on news that extreme fighting in Iraq would possibly not affect that nation’s oil supply or refineries. That bit of good news, albeit speculation, was just enough to push investors to take profits on crude for August delivery, pushing the WTI down to $105.69 by 11 p.m. 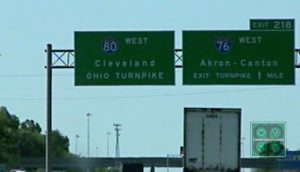 Drivers across Ohio enjoyed a major price decline. For Cleveland, the cost of gas dropped 15¢ per gallon, according to the weekly EIA report. Region by region, only Midwestern drivers enjoyed a dip in the price at the pump this week. 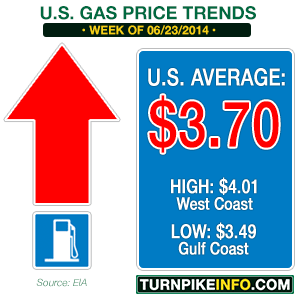 The average regional price of gas dropped about 2¢ per gallon during the past week, the E.I.A. reported, a decline that was spurred by significant price changes in Ohio and Illinois. Drivers in the Buckeye state, on average, enjoyed a 13¢ drop in the per gallon price of regular unleaded. In Cleveland, the price declines were even greater, as drivers enjoyed a 15¢ per gallon drop in prices. Chicago, which often dominates Illinois’ price points, enjoyed a 9¢ per gallon price decline. The Rocky Mountain states did not fare so well, and neither did the Gulf Coast states. Prices in Denver pushed upward over 7¢ per gallon as the broader Rocky Mountain region saw prices jump nearly 8¢ per gallon. In the Deep South, drivers in states from Alabama to Texas watched as prices pushed upward by about a 7¢ per gallon. However, the Gulf Coast enjoys the lowest regional price of fuel, at about $3.49. For truckers, the cost of diesel is heading back up, as well, bringing an end to a six-week streak lower prices. Diesel fuel pushed up about 4¢ per gallon across the U.S., but prices along the West Coast moved even higher, up about 7¢ per gallon. The price increases were the largest endured by truckers since the end of February.